Build Yourself a Better Financial Future. Today. Join the first family of Black men enhancing their personal finance through social asset building. Less than 25% of us are consistently saving a portion of our income. 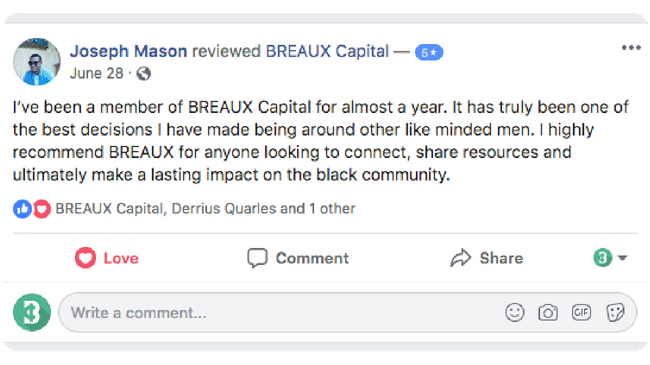 With BREAUX Capital, your stash automatically grows every two weeks. What better way to ensure that your net worth and liquid capital are steadily increasing? When you find something better put us up on game. Active members are the foundation of our model, cementing a community to assist you along your journey. Your continuous feedback and ideas will also be used to develop a better product. 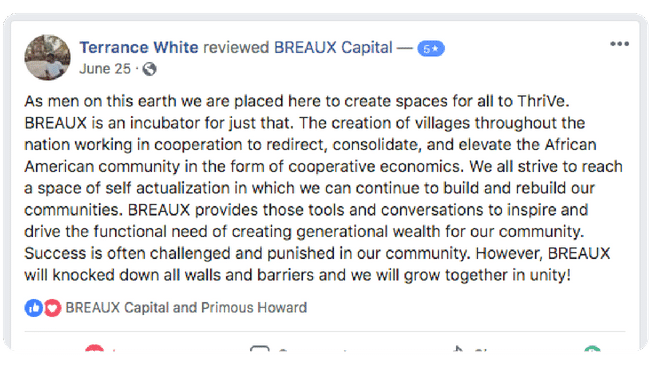 Show us another financial technology company doing that for Black millennials….We’ll wait. Leverage technology to partner with individuals around the world to keep you on track as you move toward your financial goals. Independent research, as well as our own data, shows that partnership accountability is the most powerful tool to acquire and incorporate healthier habits into your lifestyle. Look, we know your money is important to you and the people you care for. Here is why you should rock with us and not those other companies. Unlike big banks, we are transparent with our moves and your money. We have public shareholder meetings and answer questions in plain English. Your contribution account will never lose value. We can assure you that if you follow the rules of our model, you will not leave with any less than you came. Having an extended network to encourage and support you is key to success. Once you join the Fam, we look out. No questions asked. We know the financial issues you’re having because we were having them too. Our financial health model can assist you no matter where you are in your journey. You don’t have to worry about us funding private prisons, fracking, oil drilling, contaminated water pipes, or supporting idiotic political candidates. You don’t have to take our word for it. 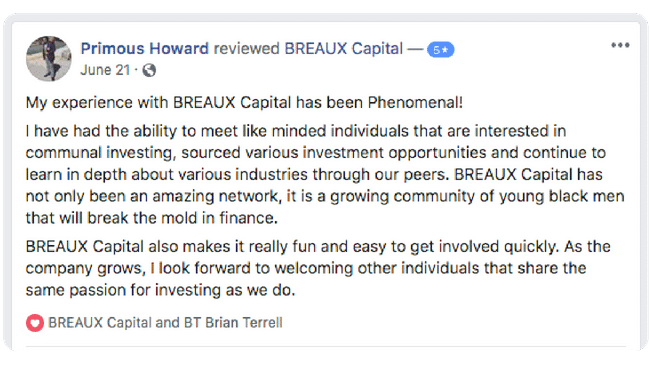 Just look at what Members of the BREAUX Capital community have to say about how we make it easy for you to be in position to invest. 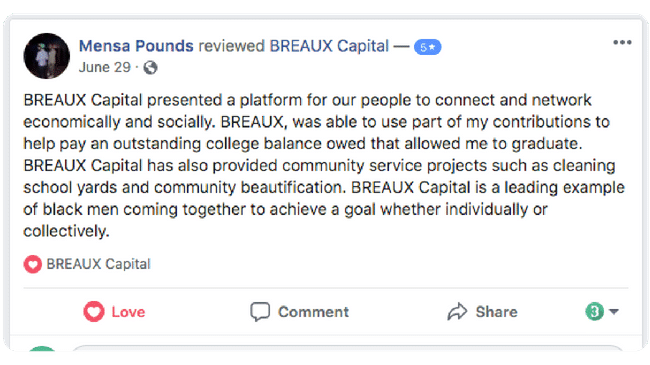 We make it easy for you to build a financial safety-net while also putting yourself in position to invest alongside a community of BREAUXS who are like-minded. All you do is choose how much of your monthly income you want to save. Set it. Leave it. Let it Grow. The money you save is yours and can then be used to invest.